I had a conversation with a lovely friend the other day, and the subject of my blog came up. It caused me to remember that I haven't checked in since I got back from our most recent adventure - and I've been home for two and a half weeks now - how remiss of me! My family and I were lucky enough to go on another Pacific Island Cruise - it's fair to say we're completely addicted to cruising now, and another one is planned and happening imminently - lucky me! I won't share tons of photos today - I really didn't take all that many, but I'll check in with my Dad, he took so many, and hopefully there will be some with me in it too! We travelled on the Explorer of the Seas - the sister ship to the Voyager which we travelled on last time. The Sydney Opera House is so very distinctive. It looks like the outside area was being set up for Chinese New Year celebrations which I believe was the day after we sailed. I love this picture - this was the view back to the ship from the beach at Mystery Island. It was just beautiful, and we all spend pretty much all day in the water ... I think this was my favourite stop on this trip. Mum and I have a new favourite bar tender - his name is Louis and he was in the Schooner Bar on deck 4. He made the best Chocolate Martinis, and I had soooo very many! On the last evening we stayed there as long as we possibly could - we didn't want the cruise to end - and I had a bit of a wobbly walk back to the stateroom. But one thing I have been happy to get back to is my quilting. I'm still plugging away, I'm over half way through the blocks now - and once they're done, then it's the border. 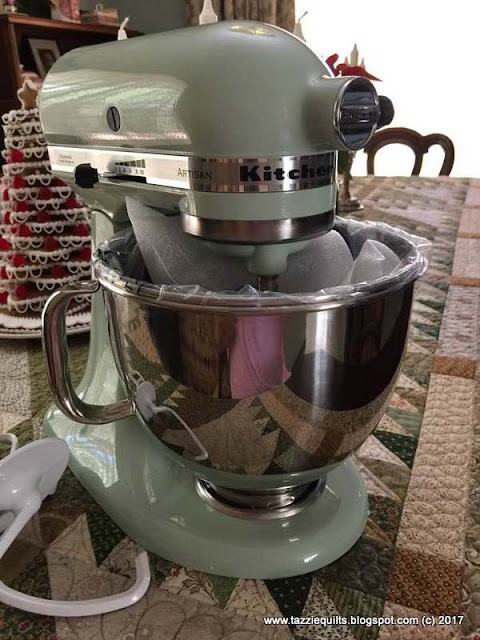 My sweet husband bought me a Kitchenaid mixer for Christmas - I have ALWAYS wanted one, but thought they were really a bit too expensive to purchase on a whim. I was amazed that he remembered - and so entirely thrilled. It wasn't a surprise on the day as he wanted my input regarding colour - and I'm so very glad he checked with me. I've only used it a couple of times so far, but once I'm done with all this quilting, I know I'll be spending a lot of time whipping up treats with this bad boy.